In 1853 the Hudson’s Bay Company constructed what is now one of the oldest buildings in British Columbia, the Nanaimo Bastion. The three-storey octagonal structure, built of massive cedar and fir timbers, has been a landmark within the city ever since. The only surviving wooden bastion in North America, it served as an office, fort and storage depot for the Hudson’s Bay Company and, equipped with small cannon on the second floor, protected the coal industry of Nanaimo. This impressive structure, located on Front Street near the harbour, was extensively restored beginning in 2009, and the project won a Heritage Conservation Outstanding Achievement Award from Heritage BC in 2011. E.J. Hughes, who spent much of his childhood in Nanaimo, would have been very familiar with this striking structure, and he began to consider it as the subject of a painting in 1947 and 1948 while traveling around Vancouver Island on his Emily Carr Scholarship. This painting is based on a detailed and annotated drawing done on the spot in 1948 and a cartoon drawing in the collection of Jacques Barbeau completed in 1950. The painting itself, as the dates on verso reveal, was worked on over several months in 1950 and completed in 1951. It was one of the initial group of canvases which were purchased from Hughes by Dr. Max Stern of Montreal’s Dominion Gallery in that year. In common with most of Hughes’s work of the early 1950s, The Nanaimo Bastion has a deliberate composition, and one might mistakenly assume that, with its crystalline atmosphere and simplicity of form, it was the work of a naïve artist. A close analysis of the composition reveals, however, just how carefully Hughes considered all aspects of the composition. The viewer is immediately struck by the point of view that Hughes has adopted – we look at the bastion and the other elements of the scene from an elevated position. This almost aerial perspective gives the image an almost diagrammatic clarity which is both striking and remarkably resonant. The image has an uncanny quality that is hard to forget. Hughes has given us a plenitude of visual information but has been careful to keep the composition from becoming either too busy or unfocussed. The cartoon includes several compositional elements (more people and text on the buildings for example) that have been eliminated or clarified in the final painting. 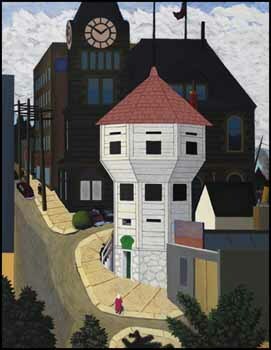 Hughes directs our eyes through bright patches of colour – the bright pink of the coat of the woman in front on the bastion, the green sign over the door and farther down the street, the red patch of a sign on one of the buildings – as well as through the placement of people and cars and the active brushwork of the roadway. Hughes has also been careful to edit out unsightly elements such as the telephone and electrical wires on the poles that line the street, even as he has included elements of rigging on the steamer just visible on the right side of the painting. He has concentrated our vision by compressing the composition through the use of a relatively blank wall on the left side of the image that also serves to counterbalance the strong angular movement of the roadway. The broad swath of fluffy white clouds provides an excellent foil for the strong forms of the buildings. Hughes has used his skills in composition, colour and paint handling to create a whole that has a rightness and reality that is immediately accessible. The words Lawren Harris, an early admirer of Hughes’s work, wrote of Tugboats, Ladysmith Harbour (in the collection of the National Gallery of Canada) describe The Nanaimo Bastion well: “Everybody likes it…..It’s that kind of painting – factual, detailed, accurate, full of interest but its art quality transcends all of these.” An artist could not ask for higher praise.